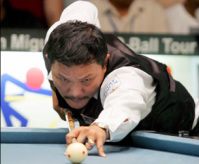 Hi folks, to all pool enthusiasts, I'm Jun Almoite, a US based Filipino pool player and a cue sports writer from Los Angeles, California.. I do write about local and international pool players, amateurs, pros, semi-pros, trick shot artists, male and female alike etc.. etc.. In short, it's all about Pool and Billiards period.. Most of my write ups are about Filipino pool players who compete nationally and internationally..The fact that I know most of them (If not all) qualifies me into writing their previous and present achievements here and abroad.. I've been a sports columnist with Philippine Times Newspaper for two years now..